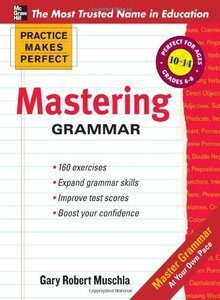 Understanding grammar is essential for your child to speak and write with competence and clarity. Practice Makes Perfect: Exploring Grammar gives your child bite-sized explanations of grammar and vocabulary, with engaging exercises that keep her or him motivated and excited to learn. They can practice the grammar skills that are challenging, polish skills they’ve mastered, and stretch themselves to explore skills they have not yet attempted. This title features 170 activities (plus answer key) that increase in difficulty as your child proceeds through the book. This book is appropriate for a 6th grade student working above his or her grade level, or as a great review and practice for a struggling 7th or 8th grader.